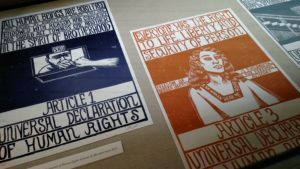 Nestled in the Special Collections Research Center on the sixth floor of Hatcher Graduate Library, Meredith Stern’s set of linocuts inspired by the Universal Declaration of Human Rights isn’t likely to be something that you would stumble upon by accident. That being said, they are well worth the trip. 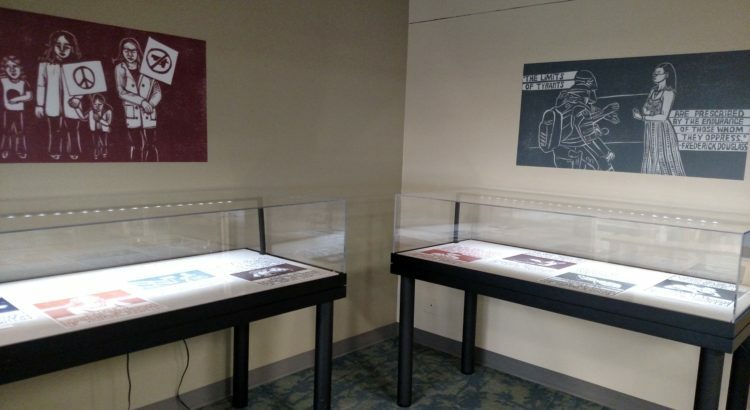 A total of 14 of her prints, which are made by cutting the design into linoleum, are on display. 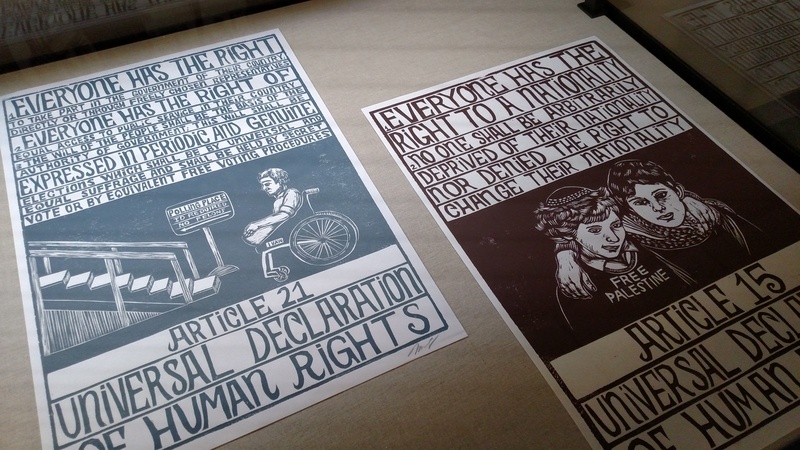 Each depicts a different article of the Universal Declaration of Human Rights, which was adopted by the United Nations in 1948, due largely to the efforts of former first lady Eleanor Roosevelt (see the preview for this event for more information regarding the document). In each print, the text of the article frames an image representing it, and some of them include text on the image that calls to attention a modern violation of the right that that article was meant to guarantee. 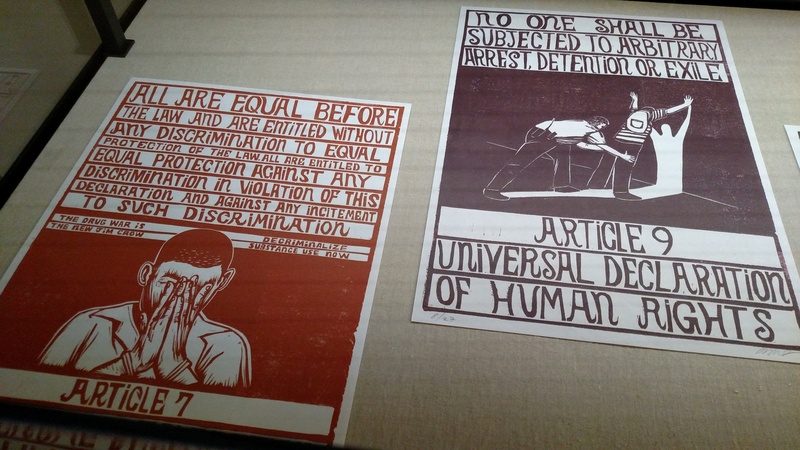 For example, the linocut of Article 9, “No one shall be subjected to arbitrary arrest, detention, or exile,” features an image of a young boy wearing a backpack, with his back to onlookers and his hands on the wall, being searched by a policeman. Article 3, “Everyone has the right to life, liberty, and security of person,” is accompanied with the text “Freedom of gender identity is fundamental for personal autonomy.” The words “Free Palestine,” along with an image of two children, accompany article 15, “Everyone has the right to a nationality. No one shall be arbitrarily deprived of their nationality, nor denied the right to change their nationality.” Issues that, in our time, have become political are portrayed in a non-political context – as rights that every person born is entitled to. 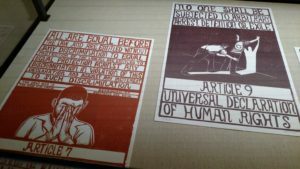 Meredith Stern’s linocuts both raise awareness of the Universal Declaration of Human Rights, as well as show that the rights defined in it are as relevant as ever. I think that oftentimes, a document such as this seems abstract as words on the page, and we don’t think of the text as having a human face. However, looking at the prints on display, this view is clearly incorrect. It becomes obvious that the rights outlined in the document still aren’t universal 70 years after the Declaration’s adoption, and that there are real, human consequences of this fact. It is up to each of us to work to change this. The collection of linocuts was on display from December 10th through February 1st, and they are an excellent example of art as a form of activism. 70 years after the Universal of Declaration of Human Rights was passed by the United Nations General Assembly, we still have a very long way to go, and every one of us must be a part of the solution.